I’m trying to finish up book three in my Men of Steele series, and I can see why so many authors swear by a series bible. In case you haven't heard the term before, a series bible is a collection of key details about everything and everyone in the world of your series, from the characters’ eye colors, birthdates, and the cars they drive, to their family history, the name of pertinent streets, and the timeline for major and minor events (current and backstory). While I keep track of a lot of information for main, secondary, and even minor characters in the Project Notes section of each book, lately I’ve been having to refer back to previous books to look for all kinds of things: thoughts about one character by another, characters’ personality/reaction to events, details about their car/plane/home, what time of year something happened, what I said about a secondary character’s background, and on and on. If I’d been more savvy, I would have started tracking this information from the moment I began writing Blind Fury, and probably kept all the books in the series in one Scrivener project (more on the pros/cons of that here). That, or created a separate project solely to serve as the series bible. Since I don't have a series bible yet, Project Search and Saved Search collections in Scrivener have been extremely helpful for tracking down details about secondary characters (who might now be primary) in past books. 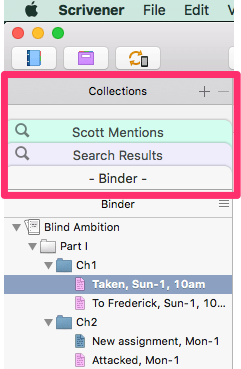 I used the search to find documents in which Scott—the hero of my current book, who was introduced in Blind Ambition—appears. Since he wasn’t a main character, these will be instances where he’s either talking, or being talked/thought about. Here’s the process I used (Mac and Windows). Open project for Blind Ambition. In the Project Search text box, type Scott. 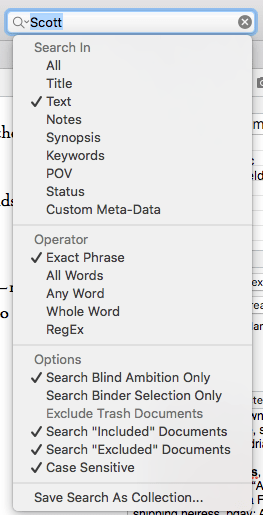 Click the magnifying glass to change the search criteria to search Text only, only documents located in the Blind Ambition folder (I renamed my Draft/Manuscript folder). I also limited the search to be case sensitive, so I’d only get references to his name, not parts of another word (e.g. Prescott). I chose Exact Phrase rather than Whole Word, because Whole Word would miss things like “Scott’s” (but will catch words like “Scottish”). A list of documents that match my criteria appears in the left sidebar. Clear the Project Search text box to see the Binder again. Click the Collections button or go to View—>Collections—>Show Collections (Mac) or View—>Collections—>Collections (Windows). The Collections pane appears in the upper portion of the left sidebar. Click the Scott Mentions tab to view the list of files with “Scott” in them. Each instance of “Scott” is highlighted (red on Mac, yellow on Windows). From here, I can go through each document, noting down any important info about Scott for continuity, e.g. how he reacts to Tara and Dan, what kind of coffee he drinks when they see him in the break room, how he dresses, any offhand mentions about his past or where he lives, and the color of his eyes. This process can be used to search for anything from characters to locations to types of events, as long as you can narrow it down with a word or two. Once you have a collection, it’s also a cinch to select and drag the files from the collection in one project to the Binder of another. Now you have them in the new project and don’t have to keep opening the old one for a quick search. Or, you could create a project to serve as a series bible (info only, no story text) and make that the repository for all new data about the series. NOTE: Click the X at the bottom of the Binder to close the Collection. Click the Collections button or go to View—>Collections—>Hide Collections (Mac) or View—>Collections—>Collections (Windows) to hide the Collections pane. To create a thorough series bible, I’ll need to reread my previous books. For now, the process outlined above is working well. 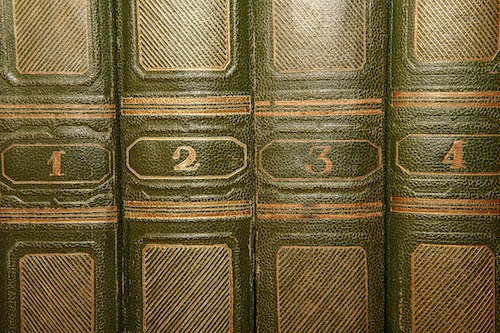 What do you include in a series bible? Got any other helpful tricks for creating one (with Scrivener or not)? Thanks for this informative and entertaining article, Gwen. Knowing more about collections will help me improve how I select from my 3,000+ poems for different publications. I keep most of their texts and document notes in one of two Scrivener projects. Each project (I checked this morning) contains around 188,000 words but even with that load Scrivener works well and fast, the only slow bit being closing a project which backs up to Dropbox, but that’s network not Scrivener. I’m glad the post was helpful, Alan. 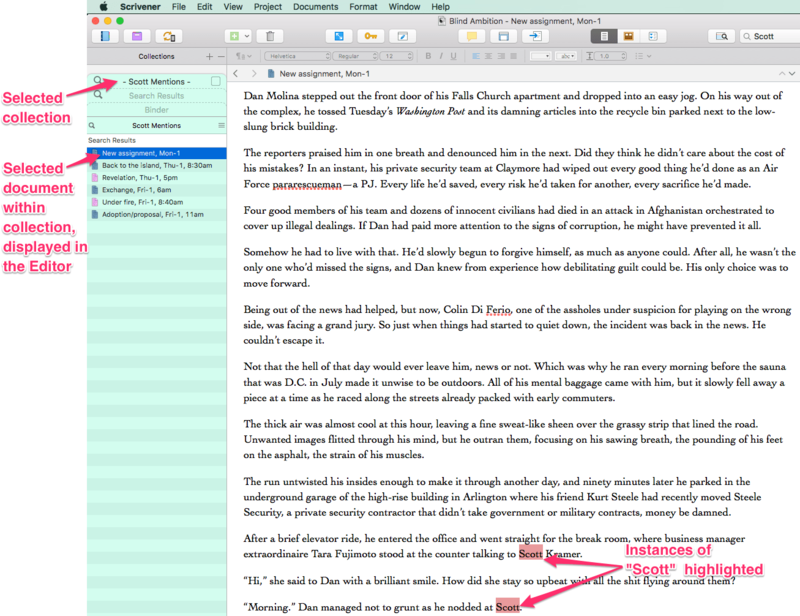 One of the benefits of how Scrivener works with files is that it can handle large amounts of text. Another option for tracking/organizing your poems is to use Labels to “tag” them for a certain type of market or category. Keywords could also be helpful for that if you have multiple tags for each document. Both of them also work as Project Search criteria. (I have posts on both on my Scrivener Articles page, accessible from the Scrivener Help menu above.) It’s nice to have other ways to group your documents separately from how you have them organized in the Binder. Good luck with the poetry submissions! When I started the third book in my first series, I also discovered I needed a series bible. I cobbled one together based on re-reading sections from the first two books and moving the character sheets from the individual book projects to the separate series bible project. I decided on a separate project for the series bible and a separate project for each book because I don’t like the idea of working my way through one large project every time I need to modify an old book or write a new one. I also had slightly different compile options for the middle book than the other two and didn’t want to trust my memory for what those were, preferring to trust Scrivener. I’ll be using your technique to flesh this out when I start the fourth book in this series. Based on what I learned from the first series, I knew I needed a series bible from the minute I thought about writing a second series. This, too, is a separate project. For this series, I keep everything other than the manuscript in the series bible project. I have a folder for characters sheets, then subfolders for Core Characters (my protagonist and her close friends), Continuing Characters, and separate folders for each book with the characters that only appear there. Of course, sometimes these one-book characters decide they want to stick around, so I then move them to the Continuing Characters folder. I also have a folder for Places, which includes maps, floor plans, and photos of the various locations used in the series. Again, I make subfolders for each major location and each book in the series. In the Research folder, I have subfolders for different categories, in my case, pictures of African violets featured in the stories, unique foods, and medical information (this series takes place at a retirement home, so my characters have the typical ailments of the elderly that I need to describe). I always keep the series bible project open in addition to the individual book project so I can refer to it and remember to add details as they pop up in the novel I’m currently writing. So far, this has worked for me. This is great, Elise! These days, I’m leaning toward having a separate series bible project as well. For some reason, I just like to have each book in its own project. Thanks so much for sharing your process/set up! Lots of helpful ideas in there. Good luck with your next book! Thank you! I’ll be doing this before my next series. Hi Gwen, as always, thanks for your helpfulness. I am wondering if there’s a way to use a search collection to create a manuscript? For example, I have a poetry book I’m putting together. I went in and labeled the pieces definitely, probably, maybe, etc. Then I made collections for each of these. Now I would like to simply move these collections into a new MS so I can move them around and take a look at the whole and decide if things are really definite, probably, etc and if so, where would they go… Seems like this should be possible, but doesn’t seem like it works. Thoughts? Sure, Claudia. If you just want to move the files, you could create a new project, and open it side by side with the Poetry project. Then, once you have your collection displayed in the current Binder, select the items in it and drag to the new project Binder. Let me know if I’m misunderstanding your question.